We are raising Laughing Frog Farm red broilers, aka freedom rangers. The chickens free range all day on pastures and in the woods. They are not confined in “tractors”. At night they go in the electric netting and portable huts that are periodically moved around our pasture. They eat bugs, seeds and grass, and we supplement with duckweed from our pond and farmed soldier fly larva. 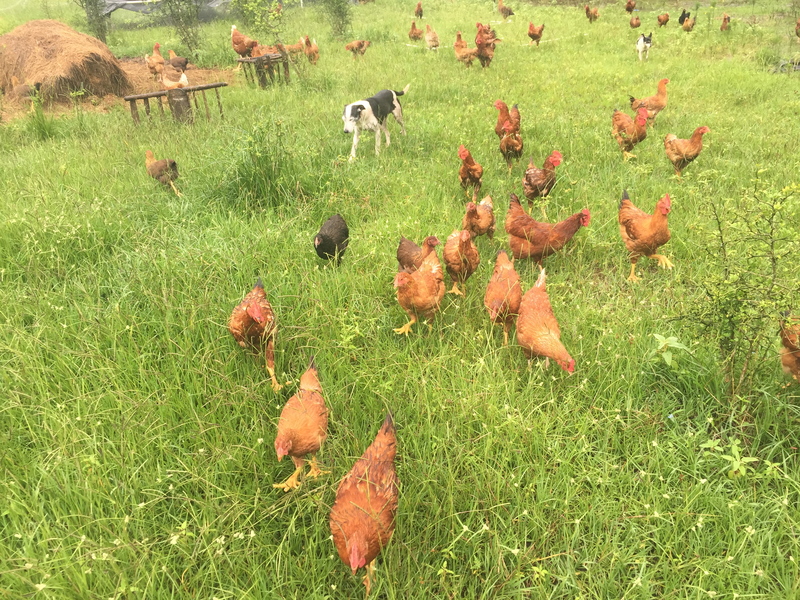 Like our laying hens, they are also fed organic chicken feed from our friends at Coyote Creek Organic Feed in Elgin, Texas. We do not use the “natural” feeds, feed that is not free of pesticides, herbicides, synthetic nitrogen fertilizers and additives. All certified organic feed is also gmo free. The red broilers were developed for France’s famous Label Rouge organic free-range chicken program. After WW II, industrialized farming introduced the now standard cornish cross chicken, with its’ huge breast and soft flesh, a chicken that could be raised to 7 pounds in 45 days, but could not walk or graze, which made it perfect for factory farming. The French began to demand the taste of traditional poultry. They developed, from heritage stock, a slower growing, more muscular chicken, to be harvested at about 12 weeks. • All birds have access to the outdoors from 9:00 am until dusk. (I let mine out before sunrise and close the door at dark). • Each bird must have at least 22 sq. ft. of outdoor grazing space. (They have a lot more grazing space than that). • Birds must be grown a minimum of 81 days. • There are also regulations about the maximum size of flocks, 4000 birds, and I will only have about 200 in a flock. • We cannot follow the requirement that the birds be sold fresh, not frozen, due to local regulations and our distribution methods. The whole birds mostly weigh between three and four pounds and cost $7.00 per pound. We will have a limited number available again beginning on April 23. Please contact me if you want to reserve one or more. We will be at the Urban Harvest Eastside Farmers Market. Previous Article Texas, religion and the law. A culturemap article on the farm.